Typically late to the game, I didn't discover Hot Rod Circuit until the mid-2000's with Reality's Coming Through, but I instantly fell in love, bought up their entire discography, and have fanatically followed Andy Jackson's work ever since—from Hot Rod Circuit, to Death in the Park, to Sloss Minor, and on and on. He quickly became one of my all-time favorite songwriters, and his music remains some of the most-played in my entire collection. What got you interested in music when you were a kid? My interest in music started with skateboarding. My first exposure to different bands like Dinosaur Jr., The Dead Milkmen, and the Misfits was from watching skateboarding videos with my friends. What was your listening trajectory like? I started out listening to popular stuff as a kid, like Michael Jackson and Van Halen—records that my mom played for me. As I got older, I was introduced to bands like Archers of Loaf, Superchunk, and My Bloody Valentine. As far as heavier bands go, that influence came from bands like the Melvins, Nirvana, and Quicksand. Hot Rod Circuit is one of my all-time favorite bands, but it's also your most prominent and well-covered project, so I'm going to skip ahead. Death in the Park released some incredible material that seemed to fly way under the radar. Is there anything you would point to as having potentially held that band back a bit? Right. Around that same time, you had joined up with former Taking Back Sunday guitarist Fred Mascherino in Terrible Things. You contributed to a lot of the songwriting on that full-length, but how was the experience of not being "in charge" different with that group? Being in Terrible Things was extremely challenging for me, because Fred is an incredible guitar player—definitely beyond my capabilities. I had to learn to play some crazy leads and sing at the same time, whereas in Hot Rod Circuit I mainly played rhythm while I sang. Not being the main songwriter and frontman was definitely a different experience, but with that said, I feel that I'm 10 times the musician that I was before Terrible Things. It was a great learning experience. I literally had to learn how to play guitar all over again. What was the "major label factor" like with the Terrible Things album? You've spoken of the studio experience having been tough yet educational, but something that I was curious about was that the production—at least to my ears—kind of changed the character of your individual style. There are some vocal passages on that album that aren't as recognizable as you. That is very true. When I hear it myself I can't believe it's me singing. A lot of that had to do with the producer pushing me to do things that I normally wouldn't do. I just recently listened to that record and was still blown away by the production and the record we made together. I'm sad that it didn't completely work out for us, but I gained some friends and more musical knowledge. Working with those guys taught me to look at writing in a different way. After you left Terrible Things, Death in the Park eventually kind of morphed into Sloss Minor, and the name change made sense because in many ways it was a different band. Like you said, there were a lot of member changes trying to keep Death in the Park alive. The biggest difference between the two for me is that Death in the Park was more of a solo record. Once the last lineup stuck, we started writing together, which felt more like a band than a solo project—hence the name change to Sloss Minor. Sloss Minor also kicked off your relationship with JMB Record$. You've worked with a lot of different labels over the years, so what makes a smaller label like JMB such a good fit for where you're at right now? JMB is a great fit for me because I'm a family man now and not really touring these days. The JMB guys have been great friends with me for a long time, and they gave me the ability to keep putting out records. That brings us to the new EP from Andy Jackson and The Mary Tyler Mormons—essentially a solo effort with various guest musicians helping out from track to track. What made you decide to operate under more than just your name? Honestly, I wanted something with my name in it because it is mostly a solo record. I wanted to add the band name because there were so many people collectively involved, and I wanted it to feel like I could have a revolving door of people playing with this band. I didn't want it to sound so serious, but to sound more fun. The name sounded funny and I wanted people to get a laugh out of it. 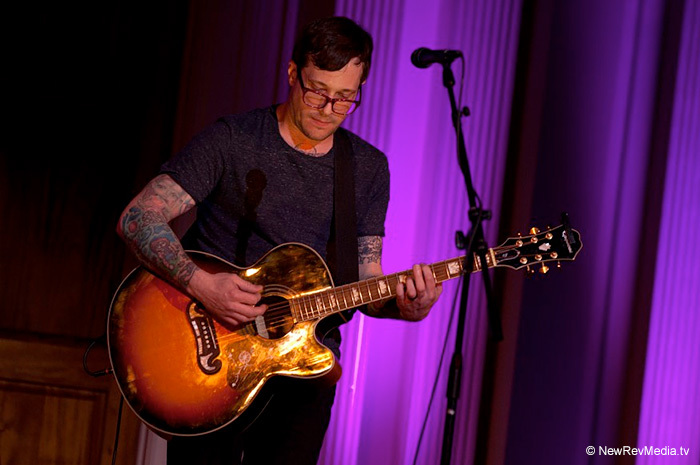 Guests include Casey from Hot Rod Circuit, members of New Found Glory, Birmingham singer-songwriter Alexa Rankin, and a few of your Sloss Minor bandmates. How did everyone get involved, and what was it like working with a revolving cast of artists? Would you say it affected the trajectory of the end result? Initially, the idea started with Ian and Cyrus from New Found Glory calling me saying that we needed to make a semi-country record together. One day about five or six years ago they drove up to my studio and we recorded about six songs. Three of those songs are on the Mary Tyler Mormons record. The songs were buried in my catalog for years, and two years ago after doing the "Where's the Band?" tour I came home and wrote some songs that seemed to fit in with those. As far as the revolving cast of artists, working with them all was great because it allowed me to make music with as many friends as possible. I got to make music with artists I respect and have always been friends with. Family life really seems to be inspiring some of the lyrics this time out. Talk about the type of perspective that that has brought to the lyrical content of these tracks. I'm not really sure what inspired it, I guess I'm just getting older and learning to appreciate where I came from, and to appreciate the family I grew up with and the family I've started now. You've cited The Wallflowers and Tom Petty as some of the influences affecting the new material, but it's definitely very recognizable as "you." In general, what are your typical listening habits these days? I love all kinds of music. Lately I've been really into Ghost and Chon. I also like the new Jason Isbell record. I listen to pretty much any- and everything. A "twangy" edge really started to seep into Hot Rod Circuit around the time of Reality's Coming Through—generally attributed to the band's guitarist, Casey Prestwood (who contributes pedal steel to a few tracks on your new EP). Now that that's carrying over into your solo work, I wonder: what's your relationship with country music? Honestly, I was never a huge fan of country music until now. Casey and I used to joke about how when you get old, you inevitably go country! But I do have a family history that is deep-rooted in bluegrass. This is a super generic question, but I have to ask out of sheer interest: what would be your all-time Top 5 desert island discs? You've been fortunate and have certainly had success in your career, but in my opinion you're still one of the most underrated songwriters out there. The vast majority of the songs you've written are instant keepers. How would you describe your songwriting process? I would have to assume a lot of it just comes as natural "magic" or whatever, but I wonder how you perceive it from the inside perspective. I usually just start playing the guitar and a melody comes out. To begin with, no deep thought really goes into it—unless I'm writing a song for someone. I just pull inspiration from things around me, whether it's a movie, friends, or a relationship—basically whatever comes to mind. You're on the Downwrite website, which is an interesting platform where basically anyone can pay for you to write and record a custom song. Have people utilized the opportunity? What has that been like? Yes, and I love it! It is so much fun and I definitely have a knack for it. Once somebody gives me their idea, I can write a song in about five minutes. I wish I could do this all day every day. Fanboy question: over the course of the last 15+ years, how many unreleased tracks do you have kicking around in your archives, and is there any chance of them ever being heard? I have no idea, but I have about six hard drives filled with songs that I'm not sure anyone will ever hear. You've been bouncing around a lot over the last few years, in the midst of which Hot Rod Circuit has been working on a new record, too. What's the status on that? It is definitely going to happen, but I don't know when it will be finished. I've written more than enough songs for two Hot Rod records. We are just spread all over the United States with families, and currently have no label. What about Sloss Minor? And do you have any other new projects cookin'? Sloss Minor has written a few new songs and is planning on making a record as well, and I've already written a few more Mary Tyler Mormons songs. Currently, the main focus is to get this Hot Rod Circuit record done. You've been recording in your home studio, The Jackalope Studio, for a while now. It seems like now more than ever you're really self-sufficient and able to work on music at your own pace, do your thing, and just have fun with it. Talk about the freedom that the home studio provides, and how it has positively impacted your relationship with the creative process in recent years. Andy Jackson and The Mary Tyler Mormons and Sloss Minor recordings are now available from JMB Record$, or on Spotify (here and here). Catch Hot Rod Circuit at the Taste of Chaos fest on July 16th.